It is a protein supplement with rich milk chocolate flavour. Being available in the tastiest chocolate flavour ever, this whey protein not only makes you strong, but also helps you gain lean and strong muscle in a delicious way. Enriched with the goodness of pure whey protein and rich milk chocolate, MuscleBlaze Whey Protein, Rich Milk Chocolate is easy to digest and gives you quick results. That is why it works as an ideal supplement to give you instant energy after a tough workout session. This health supplement enhances your performance at the gym by giving you increased energy and muscle growth. The presence of branched chain amino acids, proteins and essential amino acids helps reduce the damage caused to the muscle tissues that further gets worn out and fatigued due to excessive exercise. It also reduces the breakdown of muscles after workout sessions. 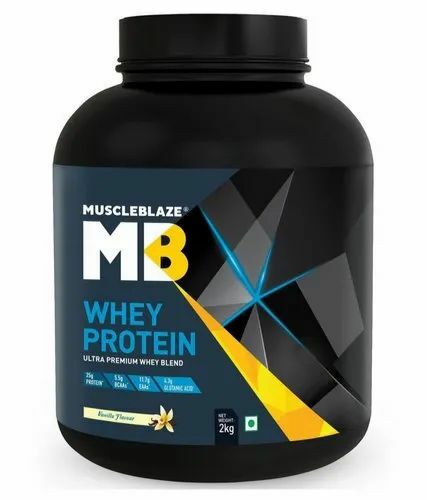 MuscleBlaze Whey Protein, Rich Milk Chocolate offers high amount protein per serving and enhances muscle anabolism to trigger fast buildup of lean muscle. It contains fats and carbohydrates in minimum amounts to ensure that you get that chiseled look without flabby tissue. It can be had before, as well as after your workout for best results. This bodybuilding supplement enhances the body's metabolism and aids in weight loss. Established in the year 2013, at Gurgaon (Haryana, India), we, "Anandit Nutrition", are a leading name in the industry, engaged in trading and supplying a wide range of Protein Supplement, Weight And Muscle Mass Gainer, Multi Vitamin, Pre Workout Supplement, Amino And BCAA, Glutamine Supplement, Creatine Supplement, Fat Burner, etc. These products are procured from the renowned brands of the market like Optimum Nutrition, BSN, Muscle Pharm, Muscle Tech, Gaspari, Dymatize, Arnold Series, Universal, Animal Series, Scivation, etc. The offered products are sourced from the authentic vendors keeping in mind the set industry standards. These products are processed under utmost hygiene environment using natural ingredients as per the food industry standards at our vendor's end. The offered products are highly appreciated by our clients for their properties like purity, excellent taste, hygienic packing, freshness, unique flavor and long shelf life. In addition to this, we offer these products in different packaging options in order to meet varied needs of our valuable clients.